One of the best restaurants in Germany. 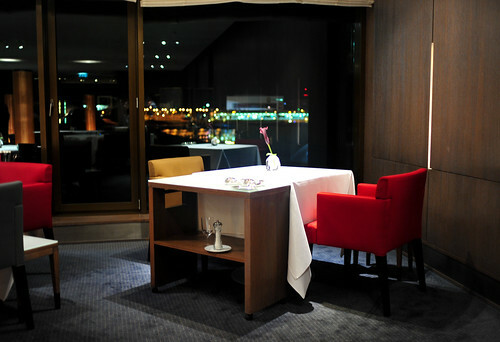 Aqua probably serves the best high-end-comfort-food anywhere. Every dish bristles with flavour. Strange but great setting. Very good service. 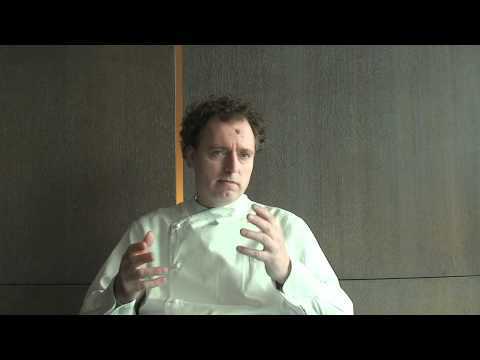 In September of last year, I was invited on an eating junket, along with a few others, to tour Germany’s top tables. The invitation came from my friend Ingo Scheuermann, author of of the blog High End Food and co-author of “bau.stil,” Christian Bau’s new cookbook, who organized this trip with the German Board of Tourism, our sponsor. The itinerary was simple, but spectacular: Five days, five cities, and five of Germany’s best chefs. Dozens of miles, dozens of dishes, and a dozen Michelin stars. A few of us inaugurated the trip early with dinner at Schloss Berg, Bau’s three Michelin-starred restaurant in Perl Nennig. From there, we shot across the country on the sleek deutsche bahn to Wolfsburg, where we picked up the rest of our group. Here is where I’ll start the story. I’ll rewind and forward to fill in the rest later. Wolfsburg is home to the Volkswagen Group (which includes Audi, Porsche, Bugatti, Lamborghini, and Bentley) and its Autostadt, an impressive complex that hosts the delivery of their cars to buyers willing to make the pilgrimage. German innovation and engineering, this place oozes it, and the attendant money that comes with it. Sleek silos rise around the corporate campus, stacked with cars; from afar, glass showcases of high-dollar micro machines. They are stunning and surreal to behold. To house the company’s high-dollar executives and clients, there’s a silo too, this one more squat than tall, with Ritz Carlton’s name on it. It too, is meticulously designed (by Frenchman Andrée Putman), sleek and fetching. The rooms are generous, especially by European standards, almost fawning with footage. The lawn is mowed with little robots, that somehow mind the water’s edge, and trees, and squirrels too. 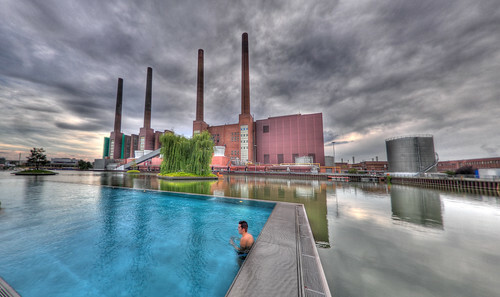 And there’s a breathtaking lap pool floating in the middle of a pond out back, with a magnificent view of the old Volkswagen factory, smokestacks and all. I relished this amenity above all others. And, of course, if no expense is to be spared, there shall be a stunning dining room, with stunning wares, and stunning food. Volkswagen delivers all of these at Aqua, Sven Elverfeld’s Michelin 3-starred restaurant. Of the meals I had on this junket, the one Elverfeld presented us was, for me, the most compelling example of neue deutsch. “Neue” it is. But it does not cut loose its mooring from the mother flavors of its chef. Fat trimmed lean with acid, this is the story that makes German cuisine so readable to me. And Elverfeld narrates it wonderfully, with wit and precision. His food is playful, like a frozen balloon of handkäs, a pungent, sour milk cheese, over which warm vinaigrette was spooned to reveal a hollow heart. Germans will know this dish – traditionally, a marinated cheese – and its amusing title – handkäs mit musik – suggestive of the tunes you’ll toot after you eat it. But not in this form, dripping and dramatic, finished with crunchy croutons. This was neue deutsch. Or, an homage to Piet Mondrian, a gridded plate of lamb, potato, and a tangy herb sauce topped with a grassy herb salad. Its rigid, Dutch borders belied its comforting, German appeal. And playful too is the sommelier, Jürgen Giesel, who started our dinner with a taste of wine, served in black glasses. We were asked to guess the type and origin of the wine. My table mates went all over the world, but not to South Africa, whence this juice. Elverfeld’s food is precise, German engineering at its finest. Every little detail was exact, every corner crimped; every pleat, pressed. 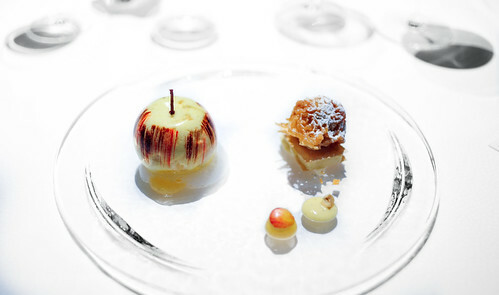 Many of the service pieces were designed by Elverfeld, to ensure that his food, like little cigars of bienenstich (toasted almond and pastry cream), for example, would sit just so, and that cornettes of crab wouldn’t list or lean, soiling the magnificent tablecloth, woven to appear as if a million bubbles were surfacing on the tables at Aqua. The meal started with a crowd of pretty canapés, a smattering of Germanic snacks, like currywurst, and konigsberger klopse (a Prussian meatball with white sauce), and “toast Hawa’ii,” a long-distance rendering of the tropics: pineapple, ham and cheese. It ended in similar fashion, with a refreshing cup of Beeren-muesli – essentially, yogurt and granola – and a parade of snacky sweets, like prinenrolle – a chocolate and biscuit club sandwich, if you will – and linzertorte – and other petits fours, including a chariot of bon bons to end all chariots of bon bons. In between, there was a bit of this and bit of that, not all of which was entirely memorable, if I’m to be honest, although all of it was beautiful and tasty, like a cocotte of sweetbreads in a nutty sauce with potatoes and celery, and a landscape of foie gras and ham, tangy with Granny Smith apple purée and toasty with kernels of amaranth. There was a formidable selection of cheeses; this was truly impressive. And a beautiful trompe l’oeil apple, a neue strüdel, if you will; that was fun and delicious. 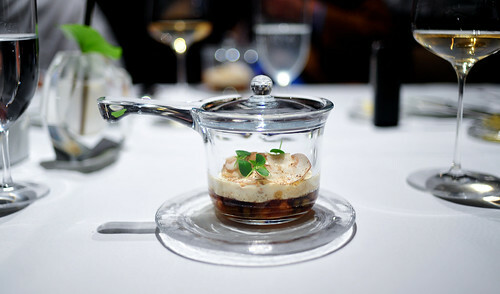 But my two favorite dishes I’ve already noted above, that frozen cheese globe, and that Mondrian on a plate. These two have stayed with me the longest, despite having had the wind stolen from their sails a bit by meals I had earlier in the year. That ball of handkäs? It was essentially that frozen balloon of Gorgonzola I had elBulli a month before, but using a different cheese, presented in a different size. And that Piet Mondrian lamb dish? Carme Ruscalleda had already rendered that Dutch painting for me in a fairytale by the sea. In a shrinking world, where culinary arts are overlapping and ideas are funneling at a phenomenal rate, I avoid debating derivation, or policing plagiarism. I’m simply not that expert. But, if we are to examine the voice of neue deutsch and evaluate its contributions to the world, unique and significant, then I do think it’s important to take note of the references it makes, or claims for itself. Doubt not, though, that Aqua is a high, German table that will fulfill the fanciest fantasies. If not for its precision, or its luxury (some of the most stunning stemware I’ve ever seen – they grew taller with each course, until we were left with an aperitif served in what seemed like a long-stem rose), or the hospitality you will surely find here, then at least for the flavors of Elverfeld’s neue deutsch, it’s worth considering. Iced homage to my homeland. Onion tapioca, Granny Smith, and amaranth. Frankfurter green sauce, potatoe & egg. Nuts butter, mushrooms, celery, potato. Parsley, vineyard peach, and chicory. Fig, honey, & vanilla vinegar.